哇！What an interesting way to start the new year. This sign with its full name of 《卢湾区窗口服务与商业发展指挥部世博双语指南》(approximately: World Expo Bilingual Compass (issued by) Luwan District Commercial Development Headquarters) is a great window into the Chinese mind (at least into the one that deemed this sign necessary). Clearly nothing (substantially) wrong with the English here. But using Chinese characters as a phonetic crutch to teach English pronounciation is a fascinating phenomenon. I thought this particular concept to be dead and buried, though. Clearly, I was wrong. Welcome to our store! - weierkangmu tu aowo sidao! Can I help you? - kan ai hai'erpu you? I'm sorry, I can only speak a little English. - anme saorui, ai kan wenglei sibike e leitou yinggelishi. It's interesting to see that the Chinese phonetic transcription itself isn't consistent: in the first sentence the sign makers are using "澳窝 aowo" for "our" (welcome to our store) while in the last line they were voting for "阿窝 awo" (I'll find our colleague for help). It's a long sign, apparently. Please send me an original picture of this sign including its surroundings! Mail address is on the right. 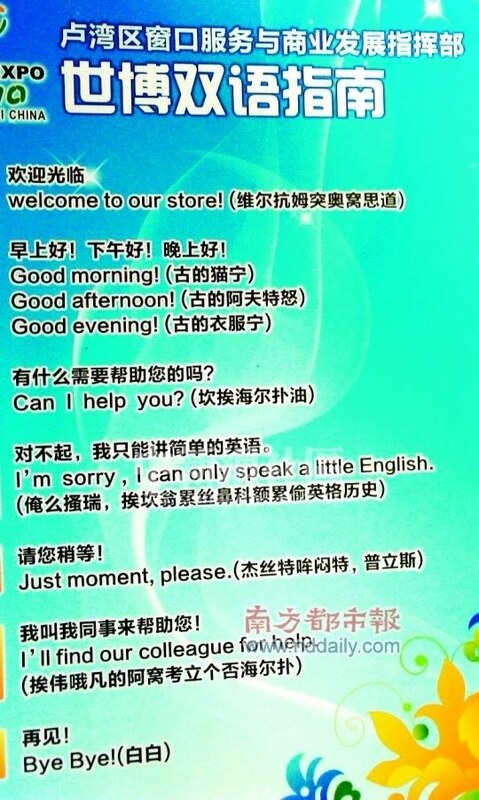 Haha, as a Chinese person who speaks perfect English, this is hilarious! And sounding out the Chinese phonetic reminds me of my mom trying to talk. I remember when I was first learning English, that was the method I used. . .
By the way, the Cantonese had some great ones from the 19th century. E.g. "pidgin" instead of "business," hence the term. . .
Good good stuty, and day day up! oh boy!! It would be a wonder if a foreigner could understand that "Chinese phonetic" English. Very creative, though.